The Walt Whitman Initiative is an international collective bringing together all people interested in the life and work of Walt Whitman. Like the poet himself, it is democratic in its principles and informal in its methods, and welcomes all persons, regardless of political, religious or ethical convictions, and without reference to personal opinions about any matter whatsoever. It seeks to establish among its members a single bond of union: interest in or love of Whitman, and a desire to learn about and celebrate his words and ideas. As our founding members are New York based, our events—at least for the time being— take his beloved Brooklyn and Manhattan as subject or site. 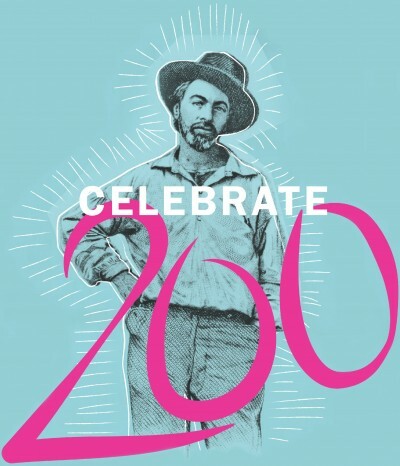 We were founded with the upcoming celebration of Whitman’s 200th birthday in mind, and one of our focal objectives is to organize and encourage a fittingly “Whitmanic” celebration for America’s greatest poet in 2019. Walt Whitman Birthday Bicentennial Publication! Interested in finding out what this Whitmania is all about? 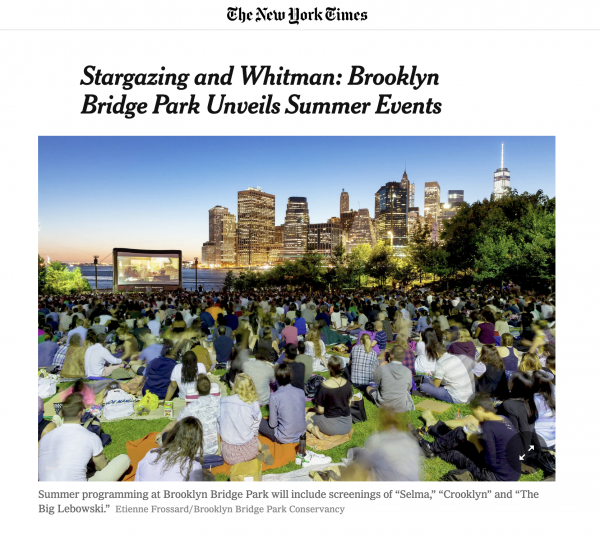 Want to find a Whitman event near you? Want to learn more about Whitman and his work? 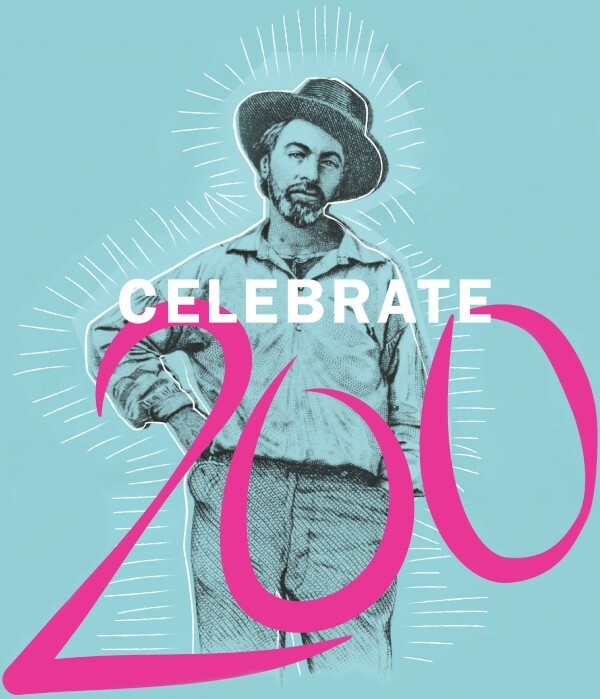 The Walt Whitman Birthday Bicentennial Publication has got you covered! Thanks to all the Whitman Consortium members that made this publication possible. Walt Whitman Stamp Announced for 2019! Thanks to the tireless work of Whitman Initiative member Ed Centeno, Walt will soon be gracing letters, postcards, and packages everywhere! The USPS just released its 2019 slate of special issue stamps and, much to our great delight, Walt will be honored alongside tributes to Marvin Gaye, Gregory Hines, the nation’s scenic rivers, and Woodstock’s 50th anniversary! 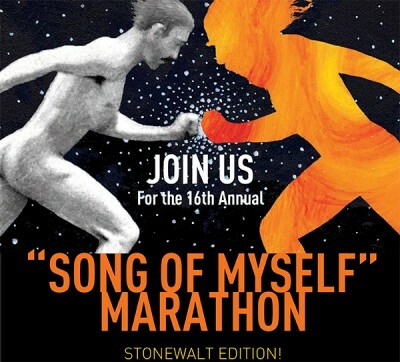 “Song of Myself” Marathon: StoneWalt Edition!! 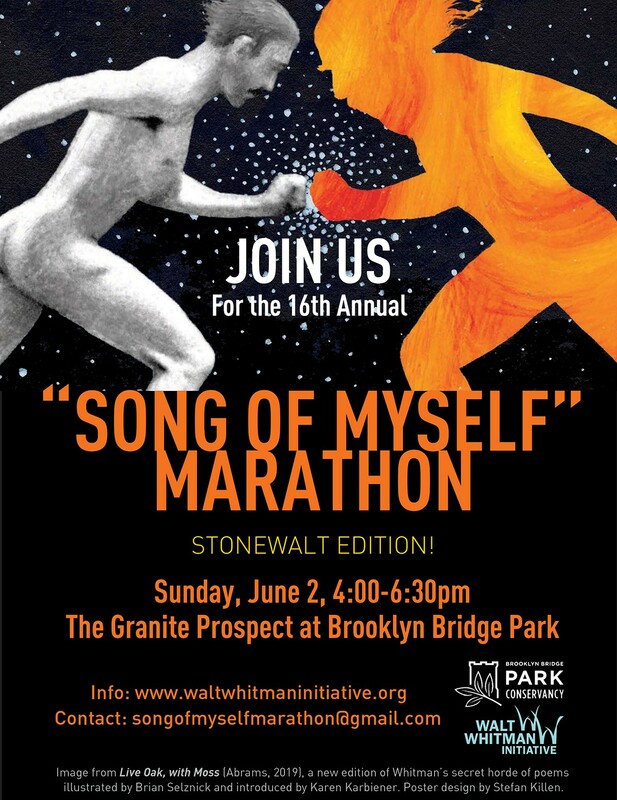 Join us for the 16th Annual “Song of Myself” Marathon, Sunday, June 2, from 4pm-6:30 at the Granite Prospect at Brooklyn Bridge Park. The Walt Whitman Initiative, along with Brad Vogel (Executive Director of the New York Preservation Archive Project), a team of historic preservationists (including Andrew Dolkart and Simeon Bankoff), and the NYC LGBTQ Historic Sites Project, have formed a “Coalition to Save Walt Whitman’s House” in an effort to draw attention to Whitman’s historical home at 99 Ryerson Street, Brooklyn, and its need for protection and preservation. Please help support our efforts to protect 99 Ryerson Street, Brooklyn— his only New York City home that is still standing, and the very place he completed the first edition of Leaves of Grass in 1855. The plain appearance of this 1850s wood frame house appearance contrasts sharply with the grand homes of Longfellow in Cambridge MA and Emerson in Concord, MA, reminding pilgrims of the urban, working-class roots of America’s greatest poet. Please sign your name to the petition to designate the site a landmark and/or write directly to the New York City Landmarks Preservation Commission (RFE@lpc.nyc.gov). Contact us for other ways to help in this effort. Thank you! Sign to Save Walt’s House! This year will be the 16th annual Song of Myself Marathon! We are calling it the “StoneWalt Edition” in honor of Whitman’s 200th birthday and the 50th anniversary of Stonewall. If you’d like to “yawp,” please email your favorite three sections of “Song of Myself” (using the 1891-’92 edition’s breakdown of 52 sections) to Karen Karbiener at songofmyselfmarathon@gmail.com. Original interpretations of your passage are encouraged– particularly with a birthday or Stonewall theme for this year’s celebrations! “Song of Myself” Marathon in the New York Times!